Thousands of participants joined indigenous protests in southwest Colombia on Sunday, putting the government of President Ivan Duque under further pressure. 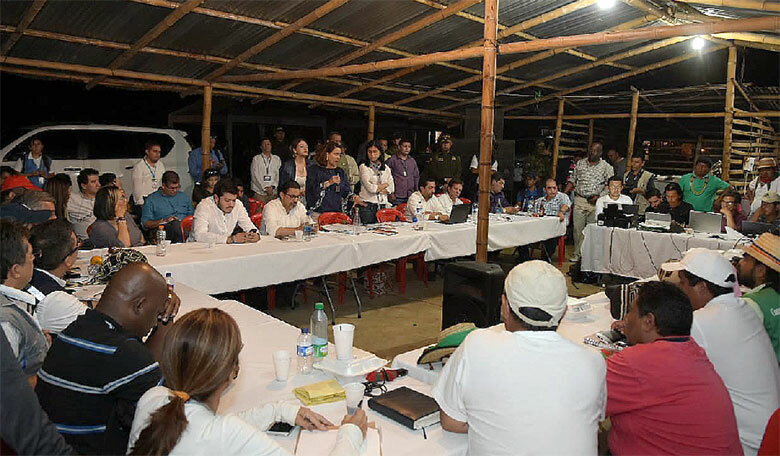 Interior Minister Nancy Patricia Gutierrez has been negotiating with indigenous representatives in Santander de Quilichao, a predominantly indigenous municipality in the southwestern Cauca province since Thursday. 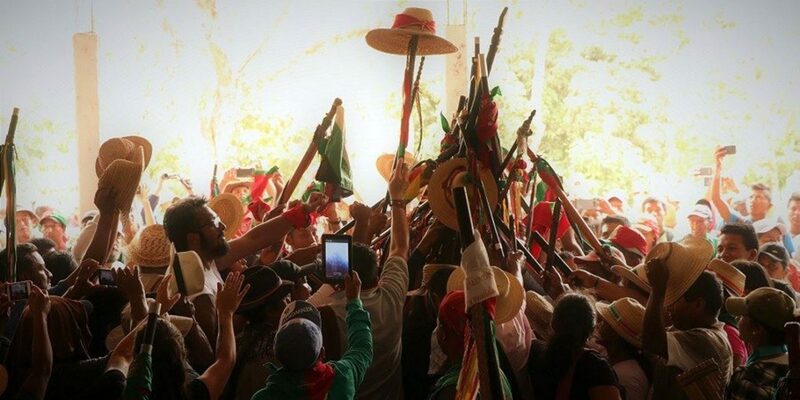 Duque sent Gutierrez to Cauca after almost two weeks of violent police attempts to forcibly break up road blocks spurred mobilizations and more roadblocks in other parts of the country and an escalation of violence. 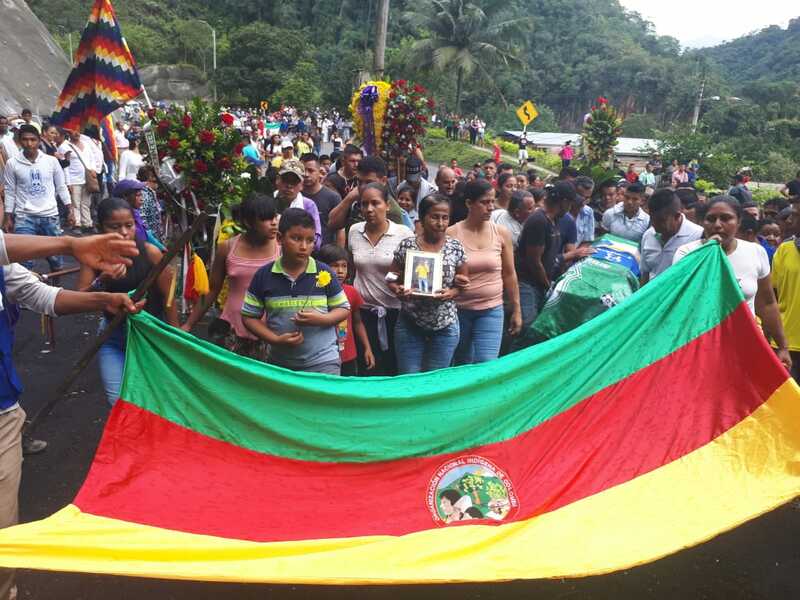 Duque initially demanded an end to the protests before agreeing to any talks, but was forced to give in when indigenous communities in Choco, Huila and Putumayo also began blocking roads. Afrocolombian communities in Cauca also joined the “minga,” or mass mobilization, to force the government to end the chronic neglect of ethnic minorities, and in particular the native Colombians. Furthermore, illegal armed groups started getting involved, allegedly killing one policeman on Wednesday. Once the government agreed to talks, all roadblocks with the exception of the one blocking the road connecting Colombia and Ecuador were lifted. To support the minga, thousands of indigenous protesters from Antioquia traveled to Dagua, Valle del Cauca. Representatives of the United Nations and the Organization of American States have been accompanying the talks. The deforestation and destruction of territories, their inhabitants and their sacred elements such as water, trees, animals, plants, and everything that inhabits them, are today victims of the unconsciousness and interest of those who want to usurp and keep them to exploit them; like multinationals, corrupt politicians, and legal and illegal armed actors who seek to advance their businesses, are just one of the reasons to strengthen the minga. The killing of the policeman, who was possibly shot dead by a guerrilla sniper, was neither the first or the last act of violence surrounding the indigenous’ attempt to protest peacefully. 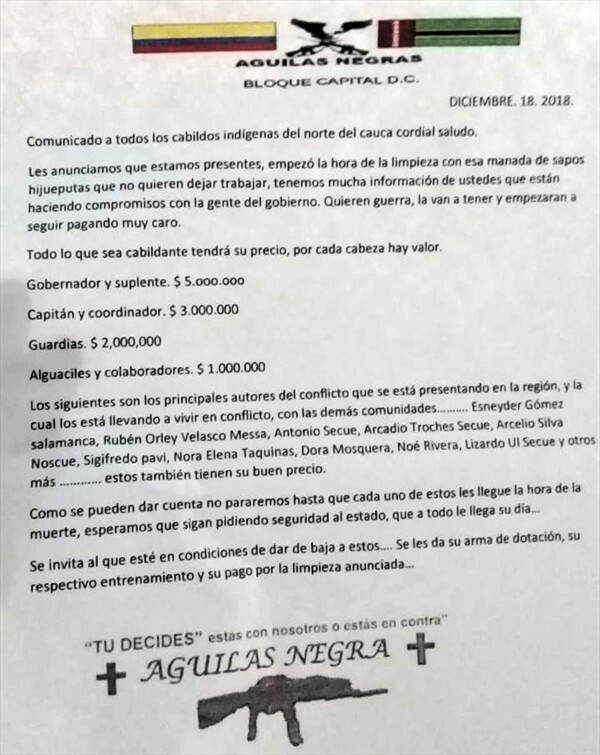 Even before the “minga,” the indigenous communities in Cauca received death threats from the “Aguilas Negras,” an elusive far-right group that in Cauca supports large landowners and is allegedly tied to the security forces. In December, the group offered financial rewards for every killed indigenous governor, guard or activist. Rearmed FARC guerrillas subsequently offered protection to the indigenous who have categorically rejected all forms of violence and have banned all armed groups from their ancestral territories. During the violent police repression of the occupation of the Pan-American Highway, an unknown number of indigenous protesters were injured. At least nine indigenous guards were killed on Thursday in an explosion. While indigenous authorities fear the blast was the result of a grenade attack, controversial Defense Minister Guillermo Botero accused the victims of preparing an explosive device even before an investigation was underway. Botero previously made unsubstantiated claims that the minga had been infiltrated by guerrillas and on Saturday falsely claimed protesters had kidnapped soldiers. Far-right business and opinion leaders close to Duque falsely accused protesters of being guerrillas while others went as far as calling the indigenous “animals” on social media. While the protesters are suffering all kinds of violence and aggression from the police, far-right groups and Duque’s increasingly radical supporters, more than a dozen Christian and humanitarian organizations from abroad have expressed their support of the indigenous and the validity of their protests.